Flank Steak is a flat, thin cut of beef that comes from a well-exercised portion of a cow so marinating is a requirement for tenderness. A good marinade also adds great flavor to the steak. When marinated for a proper amount of time and cut properly, the steak becomes quite tender - unless it is over-cooked. 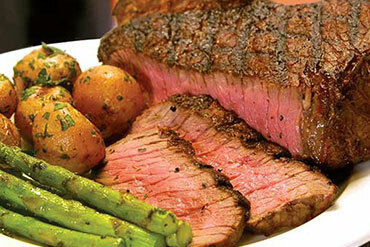 It is still one of the more affordable cuts of beef despite the fact that London Broil is a very popular meal. This recipe is perfect for summertime suppers. Preparation time does not include the time needed for marinating. Marinades are seasoned liquids containing tenderizing ingredients, either acidic foods such as lemon juice, vinegar, and tomato juice, and / or other tenderizers and flavor enhancers such as mustard, sugar, sherry or other wine or alcohol, ginger and soy sauce. Fruit is also frequently added to marinade recipes. The specific combination of ingredients give the meat the different flavors people like. You can use a marinade to baste the meat while grilling, as in this recipe, but you should never consume the marinade unless it has been thoroughly cooked to make certain all potentially harmful bacteria are destroyed. Preparation time: 10 - 15 minutes. Serves 4. 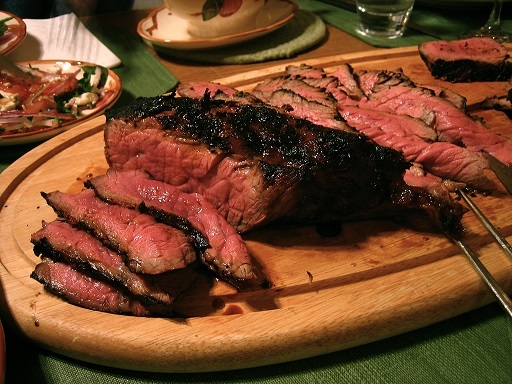 Enjoy your London Broil and the company of those you share it with! Did you know? 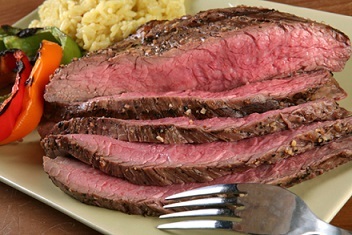 London Broil is the name of a recipe or method of cooking; it is not the name of a cut of beef. The recipe first appeared in print in the U.S. in the early 1930's, and consisted of marinated flank steak, broiled or grilled and sliced thinly across the grain.